Are more facts "more better?" Not necessarily, according to Henry Kissinger (pictured above). “I think back on something that Henry Kissinger told me, sitting on a beach in Malibu in the ’70s,” Brown recalled. “Kissinger said, ‘You have the most flexibility to act when you have the least amount of information. When it’s very clear, your options are highly limited.’"
Kissinger's observation strikes me as an important one. Knowing "the facts," and having lots of "information," can actually be a disadvantage for a policy maker, as the policy maker tries to decide what to do. Since citizens are the ultimate policy makers, in a democracy, we all need to pay attention to Kissinger's advice. But how could it be that what Kissinger said is true? Intuitively, people tend to think that the more information you have, before making a decision, the better off you'll be, and the better decision you'll make. Kissinger is suggesting quite the opposite. Here's my thought. We all tend to subject ourselves to the tyranny of the "is." Once we believe that we know "the truth" about something, and that we know what "is," we translate that "is" into an inevitability. In fact, in the human world in which we most immediately live, what "is" will ultimately depend on what we do, because we create all the human realities that then confront us from outside, and seem to be so fixed, firm, and immutable. If you "know" something is impossible, becauase you are so certain that you know what "is," you will never be able to do the creative thing that will establish a new reality in the world. 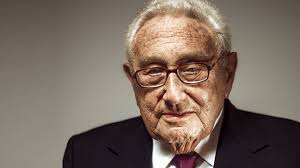 I am not a big fan of Henry Kissinger, and I am virtually certain that he didn't want ordinary people exercising that creative ability to esacpe what "is" and to make something new happen. He wants the elite (himself and Jerry Brown) to know this magic. In fact, the power that comes from Kissinger's insight is available to us all.